The black ferrule, at the end of the shaft, is a standard golf club component. A ferrule is a mainly cosmetic addition to a golf club that fits over the club’s shaft, forming a cosmetic transition between the hosel and shaft. Standard iron ferrules are from 1/8 to 1 1/4 inches long with an internal diameter of .368 inch, while standard wood ferrules measure from 1/8 to 3/4 inch long with an inside diameter of .334 inch. If you’re building your own club, or you’re replacing a shaft or a clubhead, you’ll have to install a ferrule before putting the head onto the shaft. Place the ferrule by hand onto the end of the thinner side of the golf shaft. Turn the club upside down and tap it onto the ground to push the ferrule farther onto the shaft. Alternatively, press the shaft into a ferrule installing device, choose the correctly sized hole and then push the shaft all the way down into the device, which sets the ferrule into the proper position. If you use a ferrule installing device, skip to Step 4. 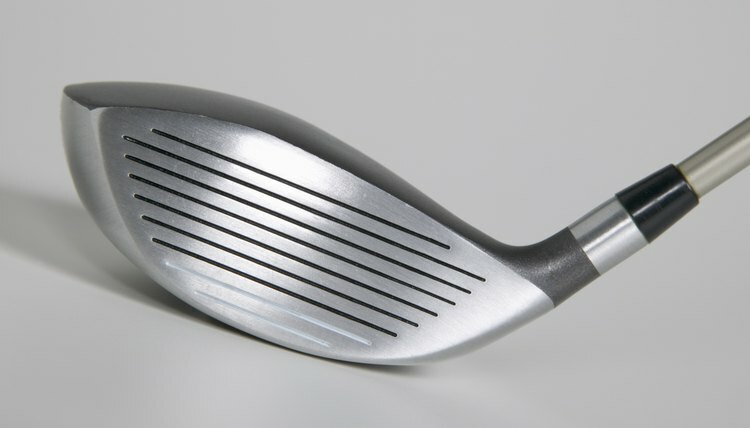 Push the clubhead onto the end of the shaft, forcing the ferrule into position. With your hand on the clubhead, tap the grip end of the shaft on the ground once or twice to be certain the head is positioned properly. The ferrule is now in its proper place. Remove the clubhead. Prepare the adhesive, per the manufacturer’s instructions, if you haven’t already done so. Apply adhesive inside the clubhead and onto the shaft up to the ferrule. Attach the clubhead to the shaft. Use a rag to wipe any excess adhesive off the club. First wet the rag with non-flammable grip solvent. Allow the adhesive to set for 24 hours.